I randomly caught Brian Helgeland's silly, but endlessly charming and immensely enjoyable A Knight's Tale on TV again for the first time in ages. Sometimes you can look through you're entire movie collection and not find something you want to watch, but if it's on TV you can't look away. That was the case again as this film began to play - the late night movie on one of the local stations. It's hard to believe the film was released nearly 20 years ago. I fondly recall seeing and loving this film back when I was in high school. I watched it over and over again and even bought the soundtrack! And I'm glad to report a repeat viewing now years later hasn't diminished the film's charm. Helgeland deserves some sort of special recognition for being the director to establish Heath Ledger. 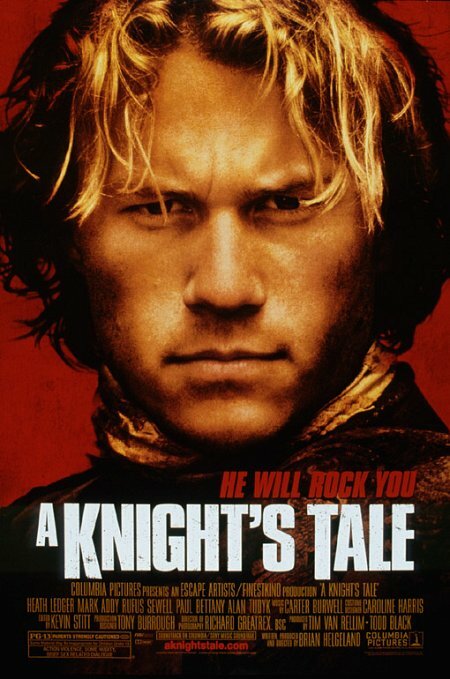 Yes, Ledger was in 10 Things I Hate About You and The Patriot before this, but A Knight's Tale made him a leading man and paved the way for some of his best roles. I honestly wasn't sure if nostalgia had colored my opinion of this movie, and that I should consider it more a guilty pleasure instead of openly expressing how much I enjoy it - it does have a 58% on Rotten Tomatoes after all. Yet I took solace in Roger Ebert's positive review of the film which reminded me that sometimes even silly movies can be whimsical and charming and so well done that to approach it like a cynical, self-serious critic is to miss out on the joy of the medium itself. I mean it's a period piece with a classic rock soundtrack that's not the least bit self conscious about how modern it is, but somehow or another it works. And that's what elevated Ebert above the rest of the critics out there. He was able to see through films others couldn't, and he had no trouble enjoying a silly little film that was made to be a fun, crowd-pleasing time at the theater rather than an awards season sensation. There is a place for both. "Some will say the movie breaks tradition by telling a medieval story with a soundtrack of classic rock. They might as well argue it breaks the rules by setting a 1970s rock opera in the Middle Ages. To them I advise: Who cares? ...Helgeland has pointed out that an orchestral score would be equally anachronistic, since orchestras hadn't been invented in the 1400s. For that matter, neither had movies." So guilty pleasure or not, I thoroughly enjoyed revisiting A Knight's Tale, and I suspect I will again in the future whenever it happens to be on TV again.